We’ve begun a series of articles from our international team about type anatomy in different scripts. 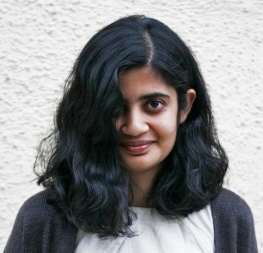 Pooja Saxena, who recently completed Adelle Sans Devanagari, offers her informed take on that Indic script. If you read Azza Alameddine’s article about Arabic type anatomy, make time for this one as well. If not, now is a great time to catch up on both! Naik, Bapurao S. Typography of Devanagari, vol. 1 Bombay: Directorate of Languages, 1971, p. 214. Courtesy of Vaibhav Singh. With its large and limitless character set, many moving parts, and complex shapes, Devanagari script can feel intimidating to someone new to it. The lack of common terms for the anatomy of its letters and their metrics only makes this problem worse. The issue of terminology is also faced by those who are native or fluent: How do I describe to someone a part of letter if we don’t have a shared vocabulary? It is not as if no terminology exists, but it hasn’t gained the same currency as its Latin counterpart. To that end, this article is an attempt to simplify and unify the nomenclature for the metrics and anatomy of Devanagari letterforms. S. N. Bhagwat is usually credited with doing the first graphical analysis of Devanagari letterforms, albeit these were handwritten and not typographic. 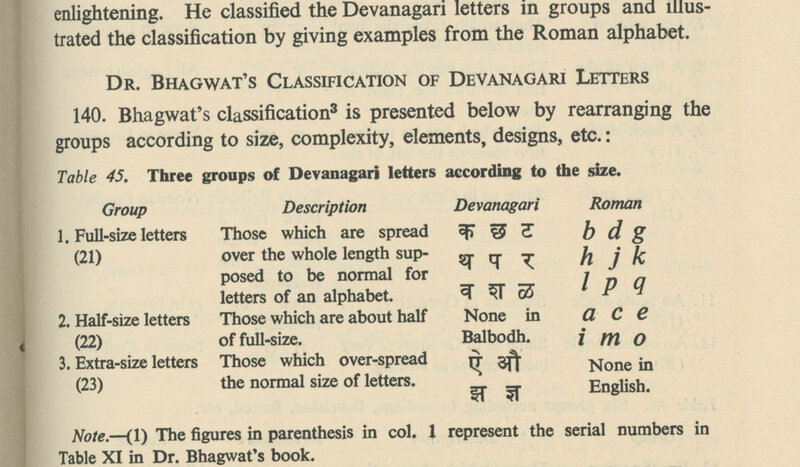 In his analysis from 1961, Bhagwat divided letterforms into categories based on their construction and shape, as well as created a scheme for anatomy. 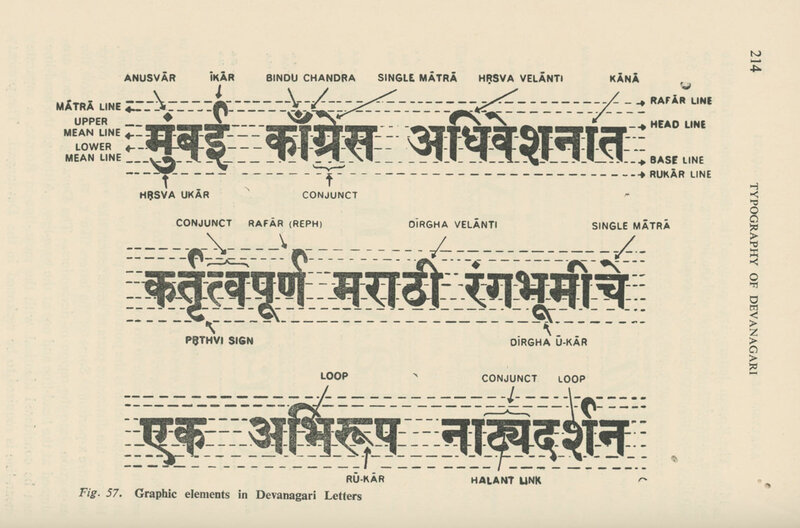 A more fine-tuned version of the same approach is seen in the work of Bapurao Naik, author of the monumental three-volume work Typography in Devanagari, published a decade later in 1971. Naik put the basic Devanagari letters into five categories based on their vertical stem and how it interacts with other strokes. These categories are full bar with attached strokes, full bar with detached strokes, short bar, bar in the centre, and without a bar. Naik, Bapurao S. Typography of Devanagari, vol. 1 Bombay: Directorate of Languages, 1971, p. 205. Courtesy of Vaibhav Singh. Naik, Bapurao S. Typography of Devanagari, vol. 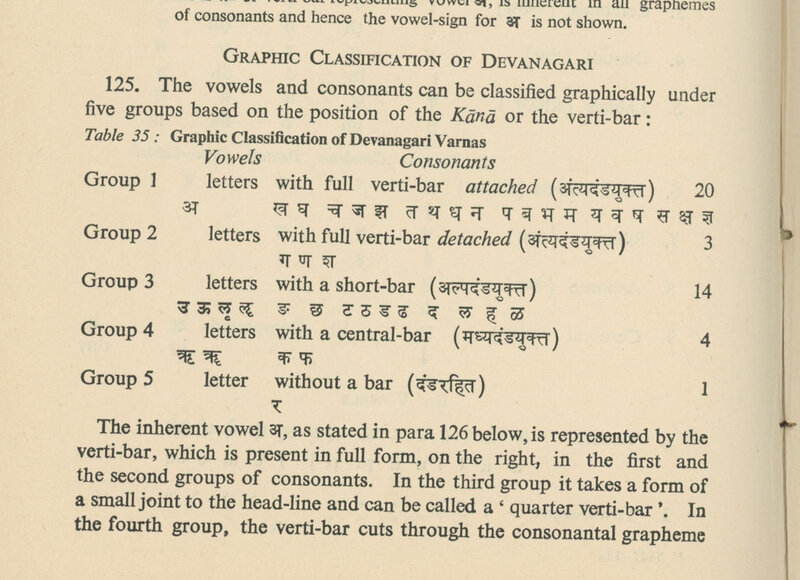 1 Bombay: Directorate of Languages, 1971, p. 176. Courtesy of Vaibhav Singh. Both Bhagwat and Naik’s schemes are less about letter anatomy, but instead highlight terms used for vowels and other signs. This is a good place to start if you are a learner. Vowel and other signs used in Devanagari, shown in Adelle Sans Devanagari. The next notable attempt to formalise type anatomy was by Mukund V. Gokhale. An interesting aspect of his work is that he roughly used the human body — in conjunction with the thickness of a pen stroke — as a reference to define the vertical metrics of Devanagari letterforms. The vertical metrics he defined were urdhvarekha (upward or top line), shirorekha (head line), skandharekha (shoulder line), nabhirekha (navel line), zanurekha (thigh line), padrekha (foot line) and talrekha (bottom line). 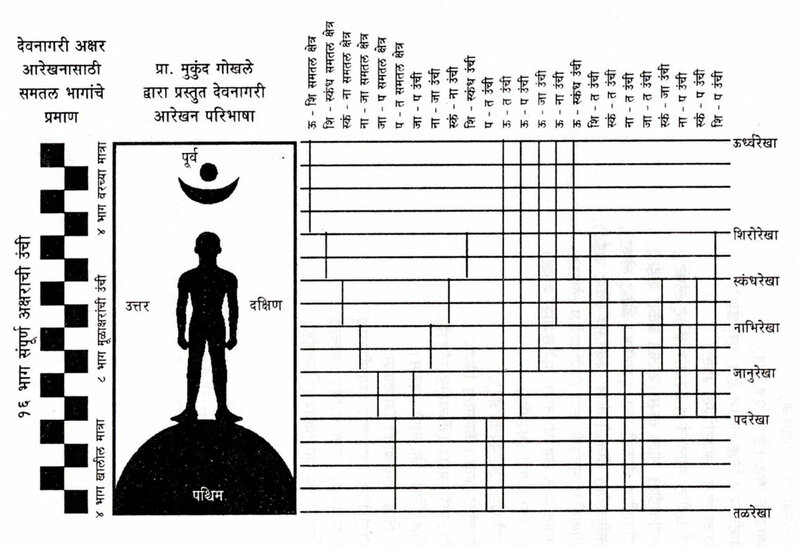 Gokhale, Mukund W. Design parameters of Devanagari, in CALTIS 83, 1983. Courtesy of Vaibhav Singh. What one must remember is that in any scheme of Devanagari vertical metrics, unlike Latin, there is not and cannot be a prescriptive model that tells us exactly where a part of every letter must come in contact with a given metrics line, the way the Latin’s x-height, caps height, ascender, or descender do. While the headline and baseline do form a fixed vertical structure, even the lines denoting the highest and lowest vowel signs are not an indication of which particular vowel and other signs reach them — they help us demarcate the vertical boundaries of a design. Things get murkier still for the remaining intermediary vertical metrics. There is no absolute rule, for instance, about precisely where the knot of the न should fall in the context of the intermediary metrics between the headline and baseline and what else should match this vertical position. It varies from design to design. One must see the metrics, barring headline, and baseline as gradations in space that can be used to describe letterforms and their overall proportions, rather than as strict guidelines in which letterforms and their anatomy must forcibly fit. Further to his 2009 paper, Anatomy of Devanagari Typefaces, Girish Dalvi has created a scheme for Devanagari letter parts and anatomy, which has been published online at Devanagari Search Tool. In his paper, he points out that a previous scheme by Mahendra Patel is specific to a particular style of typeface; Dalvi tries to rectify that. For example, he not only defines parts like “knot,” but also offers options for how it could be represented: open, closed, or filled, much the same way a serif can be bracketed, wedge, hairline, etc. Several terms, such as contrast, axis, terminal, and counter have been borrowed from Latin type anatomy, which makes the scheme easy to use in multiscript settings. Common terms for Devanagari anatomy and vertical metrics, shown in Adelle Sans Devanagari. • Devanagari is an alphasyllabic script, which has only one case and is written from left to right. One of its distinguishing visual features is that, along with sitting on a baseline, the letters also hang from a horizontal headline. • Devanagari traditionally has a diagonal axis, opposite of Latin, at about 30–45°. Modern typefaces are more experimental. • There is no concept of x-height in Devanagari. Instead there is simply the height of base letters, as measured between the headline and baseline, and its vowel signs (or matras) and other marks are attached above and below it. • Vowel signs (or matras) and other marks extend both above and below the base letters, but they are not called ascenders and descenders. Instead they are referred to by their particular names, or as above base and below base marks. • Several Latin anatomy terms such as axis, contrast, counter, and (vertical) stem are also used for Devanagari. Others like loop or knot are more specific to the script. 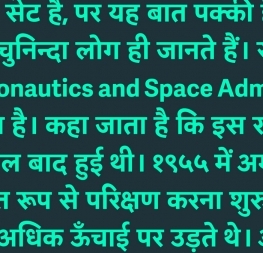 • Devanagari uses both Hindu–Arabic numerals, as well as its own version of them. The Devanagari numerals 1, 5, 8 and 9 also have regional variants. • While Devanagari has its own punctuation marks — danda and double danda — Latin punctuation such as comma, question mark, exclamation mark, quotation marks, etc. are commonly used. Devanagari Font Terminology, part of the Devanagari Search Tool. An introductory manual of Devanagari calligraphy, published by Aksharaya — Letter Conscious People.